Very high energy gamma-ray flaring activity of the BL Lac object PG 1553+113 has been detected by the H.E.S.S. telescopes. The flux of the source increased by a factor of 3 during the nights of 2012 April 26 and 27 with respect to the archival measurements with hint of intra-night variability. No counterpart of this event has been detected in the Fermi-LAT data. This pattern is consistent with VHE gamma ray flaring being caused by the injection of ultrarelativistic particles, emitting gamma rays at the highest energies. The paper can be found on the preprint server : arXiv:1501.05087. 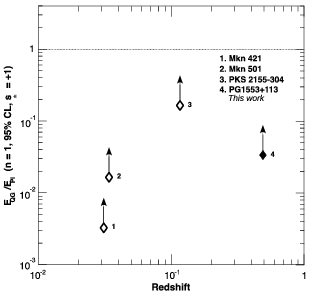 Spectral energy distribution of PG 1553+113 in γ rays as measured by the Fermi- LAT and H.E.S.S. Red (blue) points and butterflies have been obtained during the flare (pre-flare) period. The Fermi and H.E.S.S. 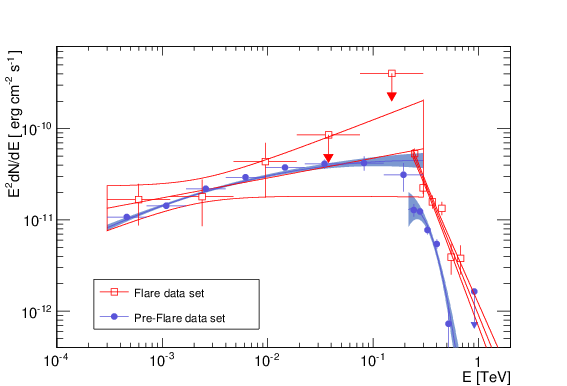 data for the pre-flare are not contemporaneous. H.E.S.S. data were taken in 2005-2006 while the Fermi data were taken between 2008 and 2012.